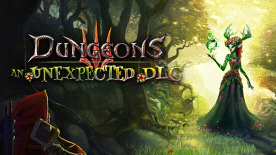 A wild DLC appeared! The disgustingly good heroes used PANIC, RUN FOR YOUR LIVES! It's super effective! After the Absolute Evil's continuous triumphs and his ultimate pwning of the Goddess of Light, the remaining little insec...er...heroes, have found shelter in the depths of the Queen of the Forest's evergreen woods. In fact, this so-called Queen truly dares to oppose the Unconscionable-And-Defacing-Nature Evil. It's time to clear woodland - Timbeeeeer! • New creep type: Rootling.